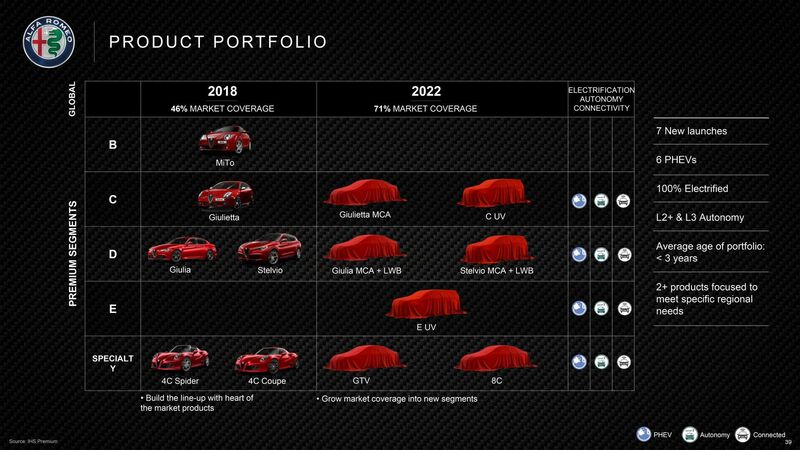 Alfa Romeo has been rather busy lately, announcing a schedule to refresh its entire lineup by 2022. 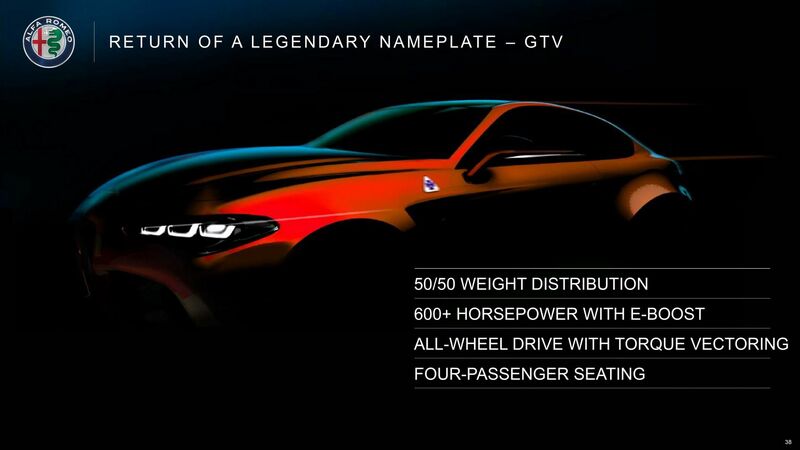 One of those announcements was the return of the famous GTV nameplate, in what will essentially be a 4-seat Giulia coupe on steroids aimed to take on the BMW 4-Series and Audi A5 coupes. Luckily for us, Alfa Romeo’s parent company FCA Group revealed a few snippets of information, including an estimated power output and teaser image. So let’s take an illustrated closer look at the Italian automaker’s newest cloverleaf offering. If you think the Giulia sedan is impressive, wait until you feast your eyes on the GTV. Think of it as expressive visual emotion, with sultry proportions and an impressive axle to dash ratio (that’s designer talk for the part between the front wheel and the cowl). Its sculptured body hugs the road with powerful rear haunches and short overhangs. Compared to the Giulia, it also features tri-daylight running LED headlamps, larger front intakes, a longer hood, deeper side scallops and a smooth, almost Hofmeister-kink-styled C-pillar. Since it’s based on Alfa Romeo’s sports sedan, we expect the GTV to share the same basic interior, albeit in a strictly four-seat layout. 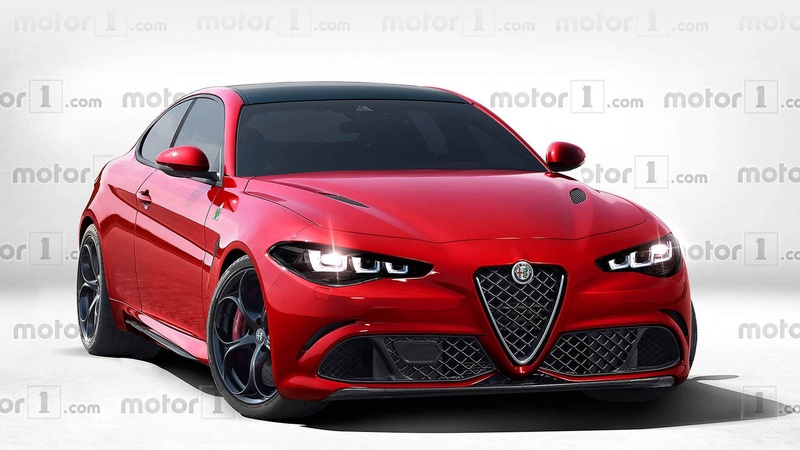 That’s not to say there won’t be changes, because by the time the coupe comes to the limelight, the Giulia will have received its first major facelift (or perhaps even replaced by a newer model if Alfa delays the GTV introduction…). 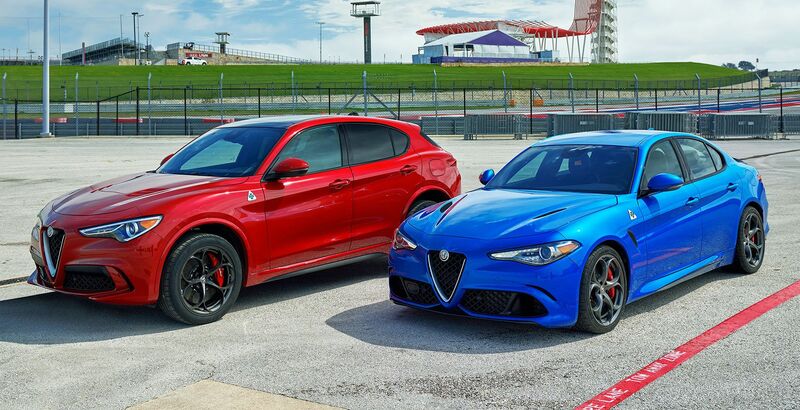 Either way, they will have to improve some lower quality materials and switch gear found in both the Giulia and the Stelvio SUV if they want to win buyers over Audi and BMW. 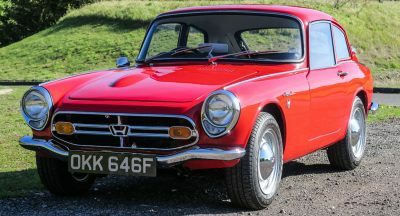 As with its sedan sibling and competing coupes, the GTV will offer buyers a selection of powertrains. Lower end models are expected to share the Giulia’s 2.0-liter turbocharged four-cylinder gasoline lump with at least 280 horsepower and rear- and all-wheel drive configurations. It remains to be seen if diesels will make the cut by the time it enters production, while Alfa is likely to introduce a powertrain to close the gap between the base and Quadrifoglio models. As part of Fiat Chrysler Automobiles five-year strategy, a major push is on electrifying all models under the corporation’s umbrella. For the GTV, this means hybrid power combined with a turbocharged V6 that will place it well above the current Giulia and Stelvio Quadrifoglio in regards to performance, as the duo uses a 505hp 2.9-liter twin-turbo V6. A Ferrari-inspired E-boost system aims to offer zero turbo lag, enabling quicker access to all 600 horses (447 kW). 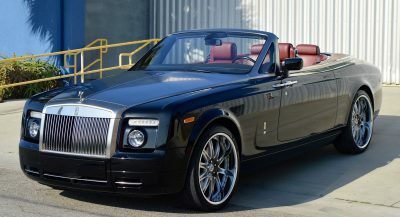 Power will be channeled to the tarmac via a ZF-sourced eight-speed auto and a torque vectoring all-wheel drive system. Alfa Romeo test driver Fabio Francia posted an astonishing 7.32 minute time around the Nurburgring back in 2016 with the Giulia QV, which was gobsmackingly faster than some Lamborghini and Mercedes offerings. With a 50/50 weight distribution, adaptive damping, aluminum weight savings and all-wheel drive, odds are that the GTV will smash that record again. As mentioned, base models will go after the Audi A5, Lexus RC, BMW 4-Series, Mercedes-Benz C-Class Coupe and their like. In Quadrifolgio trim, the Gran Turismo Veloce will battle against some seriously competitive powerhouses; one of them is the German trio, which includes BMW’s M4, Audi RS5 and Mercedes-Benz C63 Coupe. Other rivals are Detroit’s Cadillac ATS-V Coupe, Japan’s Lexus RC F and Infiniti Q60 Red Sport. As per FCA’s five-year schedule, we’d expect a launch date closer to 2021, with sales starting soon after. What are your thoughts on GTV’s return? Share your views in the comments below. lol are you kidding ? so many of the proportions are off, don’t know where to start. More-or-less true to FCA’s teaser. Want the car. Don’t like the name. Hope it comes to fruition and hope it comes to fruition on time. I just purchased a 2018 Alfa Romeo Giulia Ti Sport. This release date will give me enough time to prepare me for the release date of the GTV. I plan on going all out on the highest end model. Germany big 3 and all other car manufacturers need to worry about this vehicle. Alfa Romeo is back! Full Throttle Charlie Angel’s Two. This vehicle just motives me to get a promotion. The final product will look better than the concept pics above. It’s Alfa Romeo! Class personified! 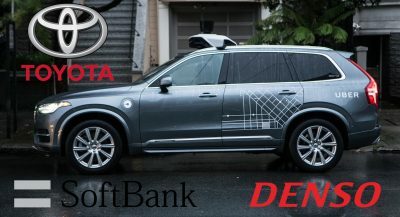 While the car might be perform well (which it did). Not everyone is able to buy the QV model. Most must settle with Veloce and Ti which still faced a heavy competition. Not to mention aftersales of big 3 is better, Alfa still has a lot to catch up. We experience this when Maserati start rolling out cars, but in a few years they are back at square one again. True, sales are important! You need sales to thrive. But buying a car is like dating. Choose quality over quantity! If everyone has one. It loses the uniqueness of the model and brand. Quality with alfa Romeo? Maybe uniqueness, definitely not quality. Class personified! Yes, I’m partial and bought a new Guilia last week. I’ve been researching Alfa Romeo for the last couple of years. Their trajectory is headed in the right direction. Like dating, not everyone can afford the supermodel, and as I said they need to make regular Giulia a good decent car, otherwise in a few years people will forget about it. I agree, and believe they have and will continue to do so. This is true! You must stay in your dating class. If you want a run of the mill car. Get a Ford or Chevy. My dad worked for GM in the 80s as a supervisor. So yes, I don’t think much of their brand. Of course, there’s other average brands out there. AF is off to a great start in their resurgence. They have the DNA and history to be relevant. FCA doesn’t deserve them. It’s like a douchebag with a smart, hot cool chick. Still too easy to be skeptical given FCA’s history. I’ll be more optimistic next year when Sergio is no longer at the helm. I wouldn’t worry about Fiat Chrysler. They might own Alfa Romeo and Maserati. But they don’t manufacturer the vehicles. Sergio will be out soon and they will be forced to revamp their whole operation. If they want to stay competitive. I actually hope Alfa Romeo and Maserati get bought by a company that can manage and re-establish their brands on a global level. Put a fork in Chrysler. They’re done! They only have regional relevance. So FCA can make money off this but not on the Chrysler 300? What a joke. Well, to answer your question; I’m pretty sure my cousins over at Maserati are going to be the premier luxury brand for FCA. Well, that’s what they tell me but I think they’re full of it. They’re pretty mean to the 300 too but I assume it’s bitterness because one of them use a Chrysler engine instead of one engineered by Ferrari – even though no such engine currently exists. I told them to stop it but they just threw spare parts from a Dodge Journey at me and told me to learn my place. Jerks. 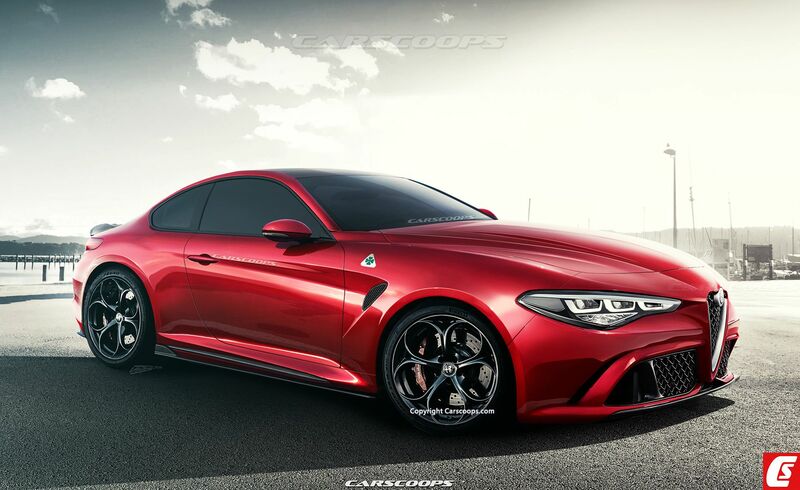 While the QV is a model that we all want, I think Alfa need to make sure the standard model performs well, that’s what I’ve seen with Giulia and Stelvio. 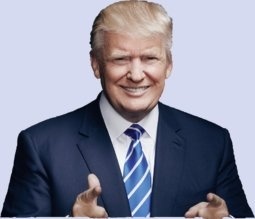 THIS SITE IS SHADOW BANNING PEOPLE THAT DIAGREE WITH THEM, ESPECIALLY ANYTHING RELATED TO TESLA OR THEIR ANTI-TRUMP PROPAGANDA STORIES. WHAT THEY DO IS BLOCK YOUR POSTS EVEN WHEN IT LOOKS YOUR POST IS ON THE SITE. TO SEE IF YOUR POSTS ARE ACTUALLY BEING SEEN BY OTHERS ON HERE, LOG OUT OF DISQUS, LOAD THE PAGE YOU POSTED A MESSAGE ON AND CHECK IF IT STILL APPEARS. YOU CANNOT SEE IF YOU POSTED AND ARE STILL LOGGED IN TO DISQUS (IT WILL LOOK LIKE YOUR POST IS ON THE SITE); YOU HAVE TO LOG OUT AND THEN RELOAD THE PAGE AND SEE IF YOUR POST SHOWS UP. THANK GOD PRESIDENT T R U M P GOT ELECTED TO STOP THESE COMMUNIST SCUMBAG TACTICS. https://uploads.disquscdn.com/images/ed81283d8462bf13cab170742a4e9b46d9afba2b596b139793bc6fa74ea903fe.jpg OUT AND THEN RELOAD THE PAGE TO SEE. Glad that Alfa Romeo actually knows a thing or two about making beautiful cars. Unlike whoever made this photoshop garbage.